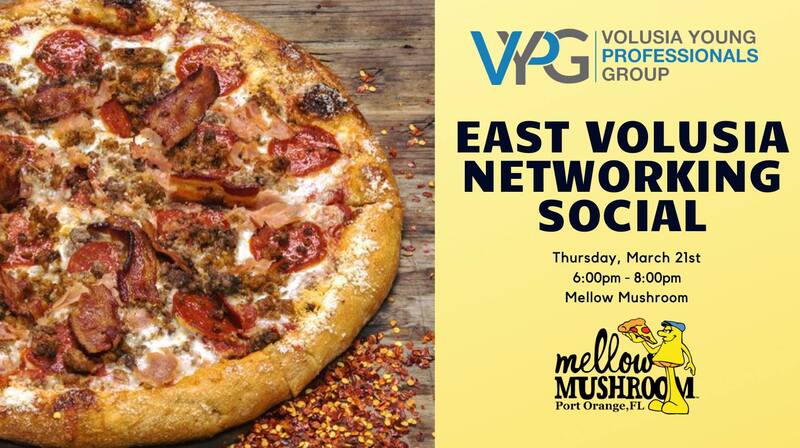 Save the date and join your Volusia Young Professionals Group on Thursday, March 21st for the East Volusia Networking Social at Mellow Mushroom! Mellow Mushroom prides themselves in serving Stone Baked Pizza, Calzones, Hoagies, Salads, Vegan & Gluten-Free options with a wide selection of beer since 1974. Cost is $5 admission for VYPG Members with pre-registration (ends at midnight onMarch 20th, $10 at the door, and $15 for non-members includes two drinks, appetizers and networking with other 20, 30 and 40 somethings looking to build professional and personal connections.